Check out our amazing space and astronomy facts for kids. Learn about different space objects and enjoy a range of cool trivia. What are dwarf planets? Why is Pluto no longer a planet? Learn the answer to these questions and more with our fun dwarf planet facts for kids. In 2006 the International Astronomical Union adopted the term ‘dwarf planet’ for solar system objects that were bigger than small solar system bodies such as comets and asteroids but not quite planets. The definition of a dwarf planet is an object orbiting the Sun that is large enough to be rounded by its own gravity but is not gravitationally dominant in its orbital area and is not a moon. As of 2008, there are five recognized dwarf planets: Pluto, Ceres, Eris, Makemake & Haumea. There are a number of other candidates for the status of dwarf planet. Some of these classifications could be resolved as NASA’s Dawn and Horizon missions venture towards Pluto in the coming years. Pluto hit the headlines in 2006 when it was demoted from a planet to a dwarf planet by the International Astronomical Union. While most astronomers agreed with the new classifications, some disagreed and still refer to Pluto as the ninth planet. Ceres is located in the asteroid belt between the orbits of Mars and Jupiter. It was discovered in 1801, well before Pluto and 45 years before Neptune. Ceres was considered a planet for around 50 years before being reclassified as an asteroid and once again in 2006 as a dwarf planet. Eris was discovered in 2005 and was referred to as the tenth planet until it was reclassified in 2006. It is the largest of the dwarf planets. Makemake was discovered in 2005 and the third largest dwarf planet behind Eris and Pluto. 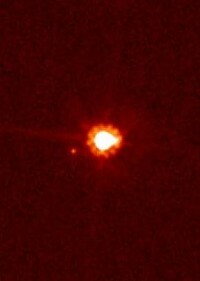 Haumea was discovered in 2004 and named a dwarf planet in 2008.